Cumbria Partnership NHS Foundation Trust and North Cumbria University Hospitals NHS Trust are seeking a leader with significant experience of building alliances and successful relationships to Chair the Board of Directors and Governors Council. The role offers a unique opportunity to take a key leadership role influencing the planning and delivery of services to the communities served by the two NHS Trusts. Crucially, it also offers the opportunity to ensure that the care and support provided to patients continues to be of the highest quality in Cumbria. This year the two Trusts begun looking at ways to formally to join together to form a single NHS provider organisation and appointing a new joint Chair is the next step in this process. 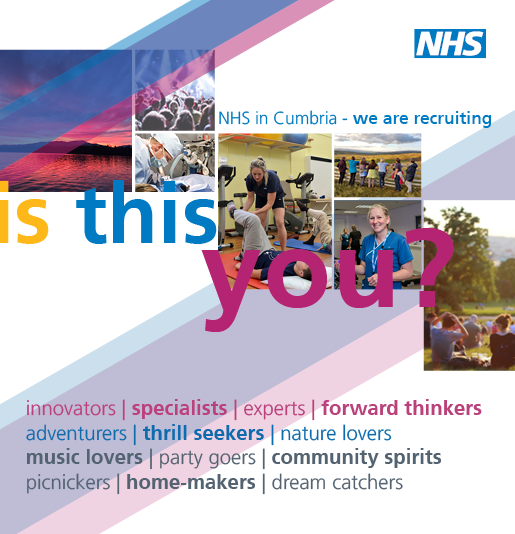 More information about the vacancy is available at: https://improvement.nhs.uk/news-alerts/chair-common-cumbria-partnership-nhs-foundation-trust-north-cumbria-university-hospitals-nhs-trust/ and the job information pack can be read on the Trust’s webpages. The terms of office of Robin Talbot, Chair of Cumbria Partnership NHS Foundation Trust and Gina Tiller, Chair of North Cumbria University Hospitals NHS Trust will end in March. We expect the newly appointed joint chair to be in post during Spring 2019. For further information, please contact Daniel Scheffer, Company Secretary at: Daniel.Scheffer@cumbria.nhs.uk.